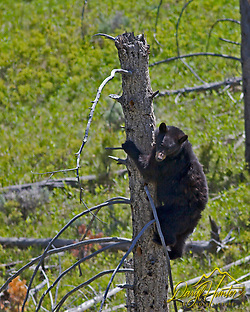 Yellowstone’s black bears are a favorite of park visitors mostly because of the clown like antics of the cubs but also because of the sheer joy of finding a bear, any bear. Black Bears can be seen most anywhere in Yellowstone at anytime except winter. They are often seen around the Tower area and in the Blacktail Plateau area between Tower and Mammoth Hot Springs. Lamar Valley is another good area and along the Madison and Firehole rivers. Black bears possess a high level of intelligence and exhibit a high degree of curiosity and exploratory behaviors. 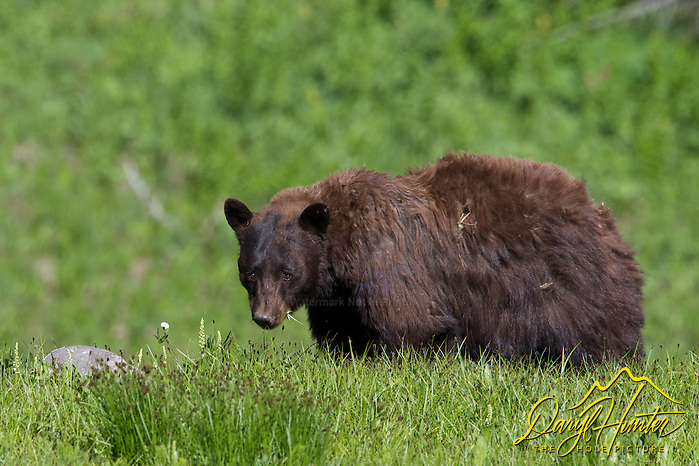 Although black bears are characterized as shy and secretive animals they exhibit a much wider array of behaviors in Yellowstone and Grand Teton parks as they have reached a degree of habituation which diminishes their shyness. Black bears are omnivorous; their diet consists of about 75 percent vegetable matter, 15 percent carrion, and 10 percent insects and small mammals. Their love for honey is well known. Bears are opportunistic and eat anything that comes their way, grass, fruit, berries, roots, mammals, birds, carrion, grubs and ants, fish, frogs, etc. Black bears are primarily adapted to use forested areas and their edges and clearings. Black bears are predators of convince and feed on larger mammals only if the opportunity exists. The diet of black bears is high in carbohydrates and low in proteins and fats; consequently, they generally prefer foods with high protein or fat content. Bears feeding on a protein-rich food sources show significant weight gains which enhances fertility. In Spring, after the bears’ emergence from winter dens, is a period of relative food scarcity. Bears tend to lose weight during this period and continue to subsist partly off body fat stored during the preceding fall. They take advantage of any succulent and protein- rich foods available; however, these are not typically in sufficient quantity to maintain body weight. As summer approaches, a variety of berry crops become available. Summer is generally a period of abundant and diverse foods for black bears, enabling them to recover from the energy deficits of winter and spring. Black bears accumulate large fat reserves during the fall, primarily from fruits, nuts, and acorns. Prime black bear habitat is characterized by inaccessible terrain, thick understory vegetation. The spruce-fir and lodgepole forest dominates much of the range of the black bear around Yellowstone. Important non-forested areas are wet meadows, riparian areas, avalanche chutes, burns, side hill parks, and subalpine ridge tops. Black bears are not all black; their coats can be cinnamon, blonde, brown, or black. Brown colored black bears are sometimes mistaken for grizzlies. 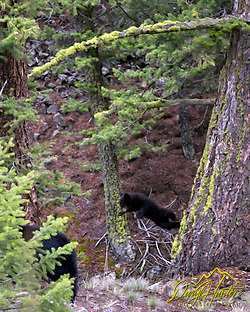 The various colors are frequently intermixed in the same family; hence, it is a common occurrence to see a black bear female with brown cubs, a brown and a black cub, or even all three colors. Black bears swim well and often climb trees to feed on buds and fruit. They have a great sense of smell, excellent hearing, but poor eyesight. They can be seen at any hour of the day, but are most active at night. Black bears have short curved claws better suited to climbing trees than digging. This enables black bears to forage for certain foods or escaping from danger by climbing trees. Black bears have few enemies, but the one they fear the most is the Grizzly. And the grizzly is given a wide berth. Black bears have extraordinary navigational abilities that are poorly understood Black bears tend to flee when confronted by humans, but may charge or stand their ground. Most black bear-human interactions end uneventfully, where the bears disappear into the woods. Sometimes the bears chase a hiker down the trail, and occasionally there is a mauling, but these are rare. Just over 55 deaths in the past 100 years have been attributed to black bears. That said the Black Bear, despite how friendly he may seem, is a dangerous, wild animal, capable of inflicting severe injury by one blow of his powerful paw or a bite from his well- armed jaws. Your chances of being electrocuted by a toaster are higher than dying at the paws of a black bear. A solitary animal most of the year, black bears pair up briefly during the mating season. Females reach sexual maturity after two years old, and have cubs every other year after maturing. Black bear cubs remain in the den with their sleeping mother and nurse throughout the winter. When very young, the cubs cry when afraid and hum when contented. When the family emerges in the spring, the cubs weigh between four and ten pounds. They are usually weaned at around six to eight months of age, but remain with the mother and den with her during their second winter of life, until they are about 17 months old. Black bear mothers care for their young and teach them necessary life skills throughout the time that their cubs are with them. 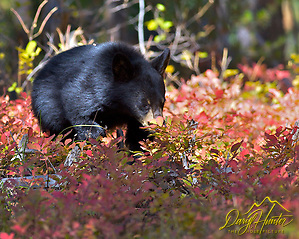 Cinnamon Black Bear hunting Choke Cherries in Grand Teton National Park. Males reach sexual maturity at three to four years old but continue to grow until they are ten to twelve years old, at which point they are large enough to dominate younger bears without fighting. Black Bears will pop their jaws, flatten their ears, rise up on hind legs, snort, woof, whine, blow, roar, moan, wail, cough, and bellow, depending on their emotion. 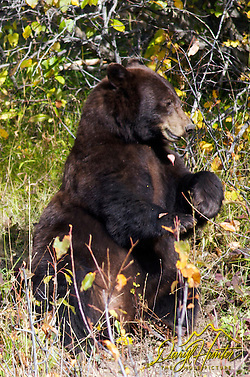 Posturing, the orientation of head and body sends a display signal to other black bears about one’s standing in the community. Male black bears do not contribute directly to their offspring but do indirectly by deterring immigration of new males, thus ensuring territorial spacing and reducing competition for food. Male black bears in spring will kill cubs because a sow with cubs will not breed. s only 10 years, mostly because of encounters with humans. More than 90% of black bear deaths after the age of 18 months are the result of gunshots, trapping, motor vehicle accidents, or other interactions with humans. Where human food of garbage is available, individuals may feed any time of day and nocturnal around campgrounds at night. Nuisance activities are usually associated with sources of artificial food and the very opportunistic feeding behaviors of black bears. A visitor who feeds or even approaches a bear too closely not only is risking injury to himself but also is contributing to a condition that may cause the injury of an innocent visitor in the future. Feeding bears s also violating regulations which have been established in an attempt to provide protection for the visitor and the animal. When you visit the Greater Yellowstone be sure to seek out where the black bears hang out because some time spent watching these characters will make memories that will be treasured forever. Posted on Tuesday, April 10th, 2012 at 12:43 pm. Filed under: Wildlife Tags: antics, Black Bears, cubs, diet, Grand Teton, habitat, life span, mating, mauling, National Park, Yellowstone	RSS 2.0 feed.